This combination photo shows Fox News host Jeanine Pirro at the HBO Documentary Series premiere of "THE JINX: The Life and Deaths of Robert Durst" in New York on Jan. 28, 2015, left, and Rep. Ilhan Omar, D-Minn., at a rally outside the Capitol in Washington on March 8, 2019. Fox News host Jeanine Pirro is back on the air after a two-week absence following her comments questioning a Muslim congresswoman's loyalties. "Justice with Judge Jeanine" returned Saturday. The former judge and prosecutor thanked her viewers but didn't directly discuss her apparent suspension. 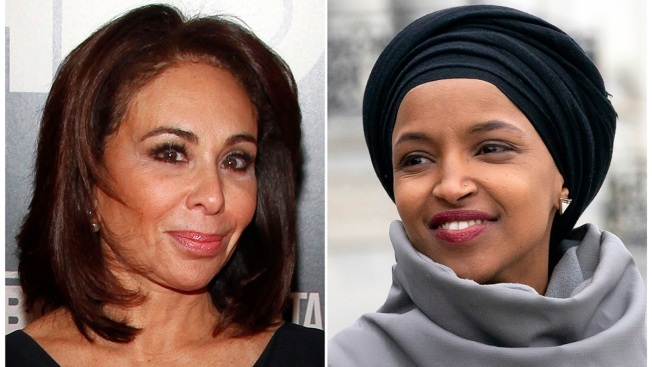 Pirro asked on-air March 9 whether Rep. Ilhan Omar's traditional Muslim head covering indicated the Minnesota Democrat followed Islamic religious law that Pirro called "antithetical to the U.S. Constitution." Pirro later said she'd simply tried to start a debate. She added that being Muslim doesn't mean a person doesn't support the Constitution. Fox said at the time it "strongly condemned" Pirro's comments. The network didn't explain her subsequent absence, declining to comment on what it called "internal scheduling matters." A message was sent to a Fox spokeswoman Sunday asking about Pirro's return.